As the technological prowess of satellite component and prime manufacturers has developed over the past half century, satellites have increased not only in capabilities but in longevity. A satellite launched in the 1990s was designed to operate for an average 12 years, a life expectancy that by the 2000s increased to 15 years. Many continue to operate for 18 years or more, but 15 remains the prevailing design life. Yet with operators seeking new strategies in today’s challenging market, and technology advancing at an ever-faster pace, could the 15-year GEO satellite life be a standard of the past? NSR’s Satellite Manufacturing and Launch Services, 8th Edition, found that commercial GEO communications satellites in-orbit today have an average age of 8.9 years. Only 17.2% of current satellites are in the process of being replenished, indicating that a slate of new orders – or decisions to not replace aging satellites – are coming in the next few years. Fleet age and replacement status has long been a way to assess operators and better understand what lies ahead in terms of CAPEX, analyses facilitated by the 15-year standard lifetime. 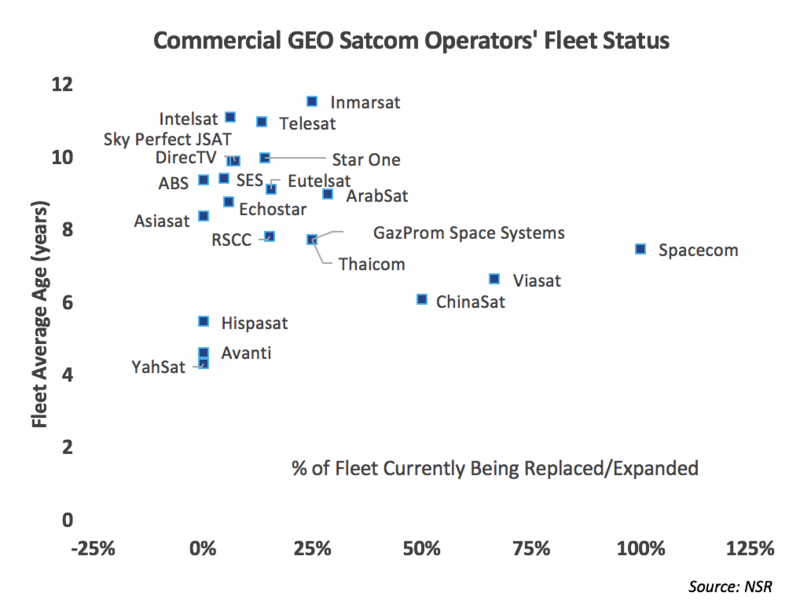 But as operators consider options to replenish satellites reaching end-of-life (EOL) while seeking new solutions to optimize CAPEX/OPEX and revenue generation per satellite, options for both shorter and longer lifetimes are appealing. Many elements contribute to a satellite reaching EOL or experiencing a reduction in capabilities, but exhaustion of fuel most commonly drives the 15-year design life. As operators increasingly turn to electric propulsion, this driver will ease, enabling satellites to remain in station-kept orbit longer than with chemical designs. A more near-term solution to lengthen satellite lifetimes is to use in-orbit servicing vehicles, either for refueling or as a tug to provide station keeping. Longer lifetimes allow an operator to generate more revenue from the satellite after it has been fully depreciated, increasing ROI and reducing CAPEX. Yet revenue potential is not the sole factor driving interest in longer lifetimes. Life extension also enables an operator to delay decision making and CAPEX on replacement satellites, keep an orbital slot, as well as potentially leverage more advanced technologies only available at a later date. NSR’s In-orbit Servicing Markets report identified demand for 8 new life extension missions annually, out of the average 19 satellites to reach EOL per year in the coming decade. Yet no systems have yet deployed, and it will be multiple years before operators can rely on this service. However, satellites remaining in operation longer can also introduce added risk to an operator’s business plan. It limits market expansion and implies keeping old, less capable technology in service while competitors launch new assets. By the end of what could be a 20+ year life, the satellite may no longer be able to competitively address demand. As new satellites are outfitted with more flexibility, particularly if software defined or with potential to be upgraded in-orbit, this risk is mitigated. Interest in short, 7-8-year lifetimes has also emerged. Given the fast pace of market evolution in recent years, it is increasingly difficult to design a satellite that will be able to competitively address demand and generate revenue over its lifetime. A 7-8-year satellite would reduce risk on market certainty, requiring only ~9-10 years commitment to a demand profile rather than 18 for a traditional satellite. Shorter lifetimes also enable a faster refresh rate to implement new technologies, target new markets, and better compete with new terrestrial and space-based assets. As launch costs continue to decline, this model is somewhat more feasible, yet still requires manufacturing costs to reach <50% of a traditional 15-year satellite to compensate for fewer revenue-generating years. This is a challenging proposition, demanding development of a new bus and components suited to the shorter lifetime/lower cost model. An added challenge is that not all components can be made more cheaply in exchange for shorter reliability guarantees; TWTAs, for instance, have a reliability that already outlives other components and cannot provide the same performance for less money and a shorter operational timespan. 7-8-year satellites would be more standardized than their 15-year+ counterparts, with specialization limited to the end of the manufacturing process and more heavily dependent on software. To justify the NRE required for these platforms and to reach the targeted prices by using mass or serial production, manufacturers will likely need pre-commitments from operators to procure a set number of satellites per year – limiting an operator’s ability to run RFPs on individual orders. Moreover, short lifetime satellites are likely to be built with smaller platforms, limiting total capacity and the applications and market that each satellite can address. It is unclear if operators are willing to accept the trade-offs to achieve such an architecture. As operators explore diverse strategies to succeed in today’s complex market, the advantages to satellites with lifetimes different than today’s 15-year average are appealing. Operators will start to experiment with shorter and longer lifetimes – and the largest fleet operators are expected to leverage both models. The fleets of tomorrow will be a diverse collection of assets more closely tailored to an operator’s unique application and customer group targets – leaving comparisons based on a 15-year standard a notion of the past.